written to entertain my American friends in Freiburg's sister city Madison, WI, with odd stories from Freiburg, Germany, and tales about my travels. In a previous blog I mentioned the territorial restructuring in France where the government wants to reduce the number of "regions" from 22 to 13. This should in principle economize administrative expenditures. From the beginning the formation of a greater Alsace-Lorraine-Champagne-Ardenne region was unpopular but the opposition became virulent in neighboring Alsace when Minister-President Valls said: There is no Alsatian people, there is only a French nation. Once more in history the Alsatians saw their identity compromised. Before the French King Louis XIV occupied the Alsace following the Thirty Year's War the region had belonged to the Holy Roman Empire. The inhabitants on the other side of the Rhine river spoke and some still speak a German dialect: Do werd noch elsassisch gredd (We still speak Alsatian here). Napoleon could not care less about languages when he recruited some of his best generals (Kellermann, Ney, Scherb, Walther) in Alsace: They are welcome as long as they fence like the French. The situation became stressed when after the annexation of the region by the German Reich in 1871 Germany forced its Germanisation. In freely using their language again the majority of the population appreciated the change until the Alsatians noticed that they were treated as second class Germans. In the Great War Alsatians fought in the German and French armies against each other. When after the war the French took over the Alsace again their policy was the forcing of the French language and culture. 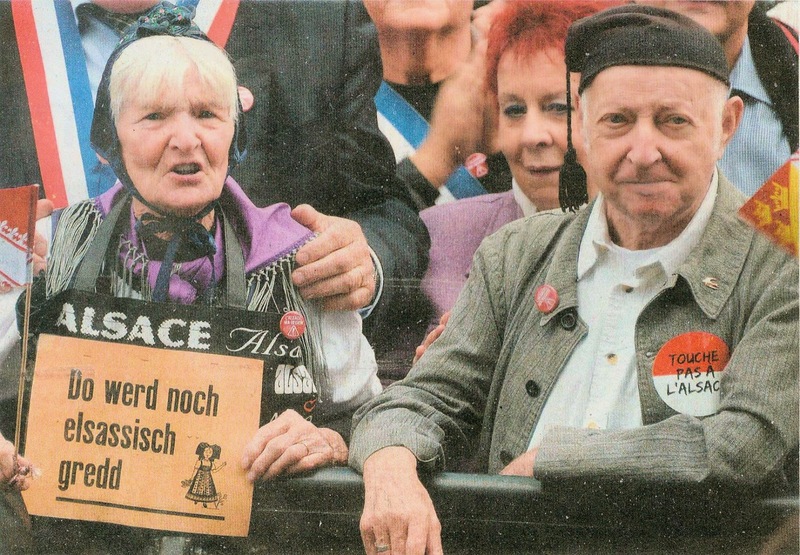 With the reconciliation between France and Germany after the Second World War the Alsatians started to define their identity as the hinge between the two cultures. The plan of the Paris administration to throw Alsace-Lorraine-Champagne-Ardenne into one basket the Alsatians felt as a slap in their face in particular as the government did not touch the regional borders of Corsica and Brittany. They call le rattachement de l'Alsace à la Lorraine et à la Champagne-Ardenne a forced Anschluss. Would it better for the Alsace instead of the ménage à trois (love? triangle) to be married with the Lorraine only or is this combination a reminiscence of the affiliation of the region to the Second Reich? In the meantime the Alsatians have abbreviated the name of the new region to Elsagne (Alsagne). Where Shall We Store Our Radioactive Waste?